Please make your designer collaboration lines in larger sizes. If its possible to make your very own private plus size label (Merona), then there is no reason why designer collaborations cannot do the same, right? 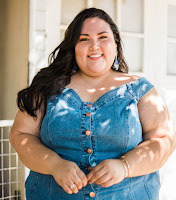 Rodarte, Anna Sui, and the upcoming Zac Posen collection are just a few of the events in which myself and many other plus size women were excluded - and will continue to be until sizes change. Do Fatshionistas not deserve to wear the same clothing as "straight size" customers? Its such a shame because you could have easily earned my dollars if pieces came in a 22/24. Target, I hope to one day see a change in your ways. If not for me, then for upcoming plus sizes that deserve equal shopping opportunities.